Go to oceansidelacrosse.sportngin.com to check out our NEW site! Registration is open for the Spring 2019 season! Check us out!!! Foil your dinner plans and stop by the Chipotle at 2611 Vista Way Ste A in Oceanside for our fundraiser on Thursday, May 10 from 5:00pm - 9:00pm. We're raising money to support Oceanside Lacrosse Club, so mention the OLC Fundraiser at checkout and they'll donate 50% of the proceeds to the OLC! We have a few spots left on our D1 (7th/8th grade) team. If you know anyone who would like to try out the fun, fast paced, game of lacrosse, send them over! Thank you so much for your support this season. It makes a huge difference! Picture Packets were handed out- please make sure to see Sue if you were not at practice on Wednesday. Dream Dinner Fundraiser is scheduled. Information will be emailed today. This is a fun, easy way for OLC parents to get together, but also for OLC to earn money! March is Fundraiser Month at Dream Dinners, so we can double our money if we are the top earners! Sign up to join us! 2018 Registration is now open. Oceanside Lacrosse Club (OLC) is a non-profit corporation, founded in 2007 to provide boys and girls in Oceanside and Vista and the surrounding communities the opportunity to play organized lacrosse. OLC competes in the San Diego County Lacrosse Association (SDCLA). Our recreational program is for youths ranging from 3rd grade through 8th grade. Our club feeds to El Camino High School (CIF sanctioned), Rancho Buena Vista High School and Vista High School (club team that has players from Oceanside High, Mission Vista and Mission Hills in San Marcos as well). Our 3rd and 4th grade Division 4 team (D4) will play in 8 regular season games and a tournament. Our 5th and 6th grade Division 3 team (D3) will play a minimum of 10 games. A majority of these are played on Saturday but there may be a few during the week or on Sunday. Our 7th and 8th grade Division 1 team (D1) will play approximately 12 games. A majority of these are played on Saturday but there may be a few during the week or on Sunday. The mission of the Oceanside Lacrosse Club (OLC) is to foster a life-long enjoyment for the game of lacrosse for youth boys and girls, residing in the North San Diego County area. The Club will offer developmental programs for youth boys and girls through the 8th grade. Programs will include teaching individual fundamental skills, the essentials of team play, proper physical conditioning, and most importantly, good sportsmanship. Through its coaching staff and volunteers, the Club will encourage players to develop a positive attitude, self-discipline, respect for others, and commitment to the success of their team and club. OLC will strive to make participation in the sport of lacrosse affordable, safe and a positive experience for players, coaches and parents. OLC is a volunteer organization. Please be sure to also register your child with US Lacrosse. You will need your child's US Lacrosse registration number when signing up. 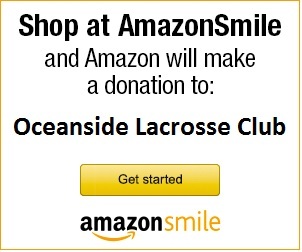 Support Oceanside Lacrosse while shopping at Amazon. Oceanside Lacrosse Club is a Non-Profit 501(c)(3) organization. those with demonstrated financial need. Chipotle Fundraiser May 10th 5-9 pm!